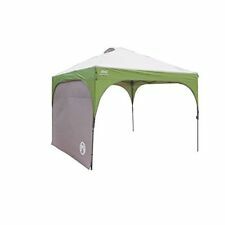 Coleman Instant Canopy Sunwall Accessory Only10 foot X 10 foot. Add more shade and weather protection to your Coleman Instant Canopy with a Coleman Instant Canopy Sunwall Accessory. This addition to a 10 ft. x 10 ft. (3 m x 3 m)canopy is made of heavy-duty fabric that stands up to winds. Get to the fun faster with the Coleman Instant Canopy with Swing Wall. Put the full-length swing wall up like an awning for another 60 sq. ft. (14.86 sq. m) of overhead shade or use it as a wall to block the sun, wind or rain. Coleman Roadtrip Beach Shade 7.5' x 4.5' Tent. Condition is New. Shipped with USPS Priority Mail. Coleman Instant Screenhouse, 10 x 10 Feet. All parts/pieces are included. Retail packaging shows slight signs of wear or damage. Coleman Instant Beach Canopy, 10 x 10 Feet. 2-way roof vents keep air circulating inside the tent. Included easy-pull wheeled carry bag fits inside most cars. Made with UVGuard material for exceptional sun protection. 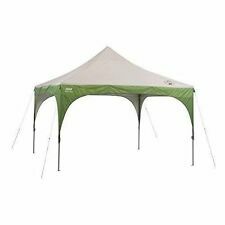 Coleman 10X10 Instant Canopy with Swing Wall Tent Shade outdoor backyard NO TAX! Brand New & Original! Ready For Camping When You Are! Functions as intended. Light wear: Has a tear in the top. (1) Coleman Instant Screenhouse. • (1) Coleman Instant Screenhouse. INSPECTOR: KG. Keep this in mind when buying an item as a gift or if you are a collector. Manufacturer's Part Number: 2000002120. The front awning provides extra shade, and the privacy door makes clothing changes simple. The shade is also versatile. The Roost Sports is your online source for outdoor sporting goods. 2-way roof vents keep air circulating inside tent. Made with UV Guard material for exceptional sun protection. Included easy-pull wheeled carry bag fits inside most cars. Protect your team from the sun on any sideline when you take a Coleman 9 ft. x 5 ft. x 4 ft. 6 in. Instant technology allows you to set up or take down the shade in a minute or less. It's so easy to use, you'll want to buy two-one for the players and another for the fans. Get to the fun faster with a Coleman 10 x 10 Instant Sun Shelter. Square canopy, vaulted ceiling. 100 sq. ft. of shade. Large feet let you step on them when extending the poles for easy setup. Rugged, Polyguard 2X double-thick fabric stands up to the rigors of the outdoors. Can be used as a standard sunshade, or you can turn it into a changing room, wind block, or a handy place to protect your gear while you play in the sun. Enjoyinstant shade on the beach without hauling along an unwieldy beach umbrella. Coleman Instant Set Up 10 ft x 10 ft Screened Canopy. No Assembly Required- Simply Unfold and Extend. Authorized Coleman Dealer + Full Factory Warranty!!! Coleman Insta-Clip Screen House 11' x 9'. Bug free space for camping or other outdoor activity. Includes carry bag, sandbags, extra-long stakes, handy dry line and floor mat. 7.5'x4'5' footprint; 57" center height. Coleman Mountain View 12' x 12' Screendome Shelter -100 sq. ft. of Shade - Four Roll Up Screen Walls for Bug Free Zone - 7 ft. 6 in. Center Height - UVGuard Material Provides 50 UPF Protection - Vented Roof Releases Trapped Heat Get protection from the sun, wind and bugs from dawn to dusk with the Coleman Mountain View 12 x 12 Screendome Shelter. In just 10 minutes you can start enjoying the 100 sq. ft. of shade this shelter provides. Lighter than a comparable Coleman Instant Sun Shelter. Color Green. Weight 33.6 lbs. This is a Super Nice Coleman 10’x10’ Instant Screenhouse Tent Gazebo Bug Proof Wind Proof In good used condition only used maybe once or twice As soon as you use a tent once it’s considered used! Don’t waste your money buy this slightly used one for a great price! Make me an offer!! Protect your team from the sun on any sideline when you take a Coleman 9' x 5' x 4'6" Teammate instant shade to the game. The retractable side panels offer players a wide view of the field, while sand pockets allow you to use the shade at the beach during the off season. Each shade is constructed of UVGuard material - protection from the sun's dangerous rays. Instant technology allows you to set up or take down the shade in a minute or less. It's so easy to use, you'll want to buy two - one for the players and another for the fans. 2-way roof vents keep air circulating inside the tent. Product Code : Coleman-2000023970 Get to the fun faster with a Coleman Instant Canopy with 100 sq. ft. of shade. The welded steel feet keep the shelter stable on concrete and asphalt. - Steel stakes to secure shelter on soft ground. 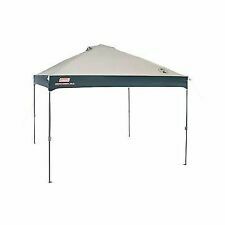 For the Coleman 10x10 new Style Straight Leg Instant Sun Shelter Canopy. This is NOT a complete canopy. ONLY the TOP is included. Give us a shot and we will make sure that you will look to us again! 2-way roof vents keep air circulating inside the tent. Made with UVGuard material for exceptional sun protection. Heavy-duty polyester canopy. Shade floor converts into a privacy wall when needed (clothes change or baby's nap). Includes carry bag, sandbags, extra-long stakes,handy dry line and floor mat. Great for keeping small children out of the sun on beach vacations. With Coleman's exclusive push-button release levers your fingers stay safe during setup and takedown. - Instant shelter has easy push button release. - Shelter provides over 190 square feet of shade. Get to the fun faster with a Coleman® 12 x 10 Instant Hexagon Shelter. • 90 sq. ft. of shade. • Rugged, Polyguard 2X™ double-thick fabric stands up to the rigors of the outdoors. • Large feet let you step on them when extending the poles for easy setup. Clean and dry. Green & silver color. Take shade and privacy to the beach when you pack a Coleman RoadTrip Beach Shade. The front awning provides extra shade, and the privacy door makes clothing changes simple. Sand bags keep the shade in place, and UVGuard material offers our highest protection from the sun's dangerous rays. The shade is also versatile. The back works as a wall, mesh window or door. On days you can't make it to the beach, take the shade to your kids' games for extra protection when you're sitting on the sidelines. Brand new Coleman Beach Shade. Think Spring Break! Think Florida!